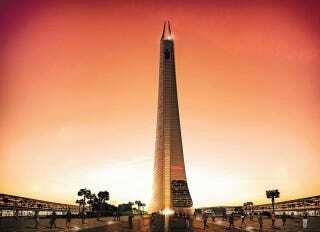 They call it Al Noor Tower (Tower of Light) and, once built in Casablanca, Morocco, it will be the tallest building in Africa. The 1771-foot (540-meter) building is a project of Sheikh Tarek M. bin Laden, designed by French architects Valode et Pistre, who obviously have been watching too much Lord of the Rings. I mean, come on! Tower of Light? That's Barad-dûr in real life. It just needs the giant fiery eye. The company says they will start soil testing in 2015.